Rediff.com » Movies » Will Marina Puratchi be released? Will Marina Puratchi be released? 'The anti-Hindi agitations had the backing of a political party, but this one did not. IMAGE: The Marina Puratchi poster. 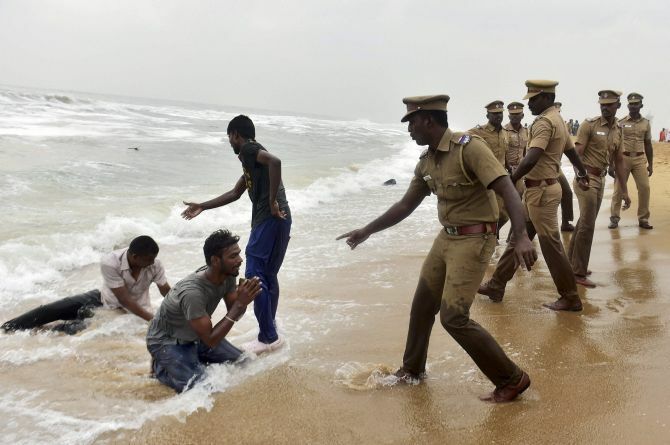 The Jallikattu protests on Chennai's Marina beach last year had no precedent. Never before had such a crowd gathered in support of a sport that is actually practised in only two districts of the state. Strangely enough, no one knows who started the protest. When it was time for the crowd to disperse, all hell broke loose as the police thrashed the students and started arresting them. The message was loud and clear: Don't take on the government. This was reiterated in the anti-Sterlite protests where unarmed protestors were shot by snipers at point blank range. Fifteen people died in the firing, but no action was taken against the police. 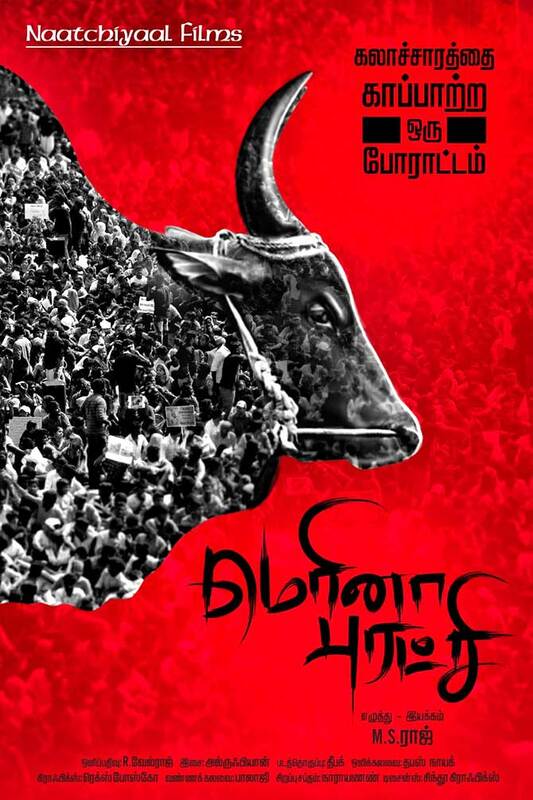 The Tamil film Marina Puratchi (Marina Revolution) now dares to take on the government. The Central Board of Film Certification has refused to clear the film for release. Oviya, who became an overnight sensation after her turn in the Tamil Bigg Boss last year, stars in Puratchi Marina and plays the character Swapnasundari. Sivakarthikeyan, who has given continuous Tamil hits, also stars in the film. Despite facing hurdles in his path, debutant director M S Raj is determined to release the film. He was on a bus when Rediff.com's A Ganesh Nadar called him on the phone. He got off the bus, and called back. "I was puzzled why a foreign NGO (PETA) was determined to stop a sport that has been practised for thousands of years in Tamil Nadu," says M S Raj. 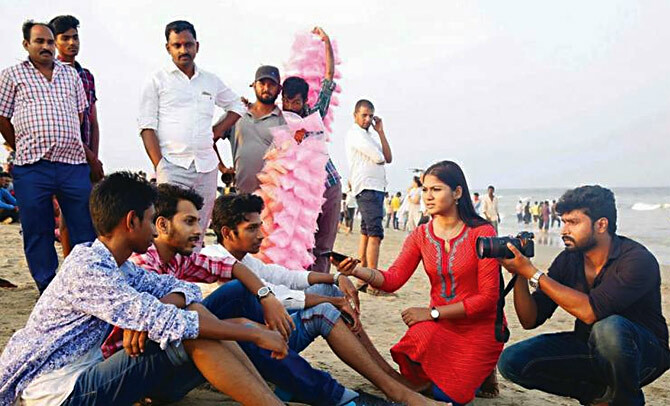 IMAGE: A scene from Marina Puratchi. 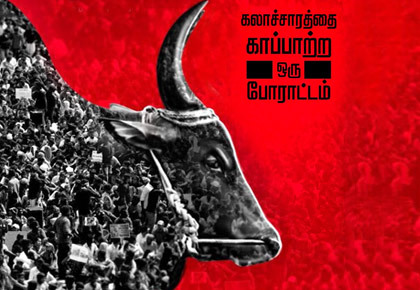 Why did you decide to make a film on Jallikattu? 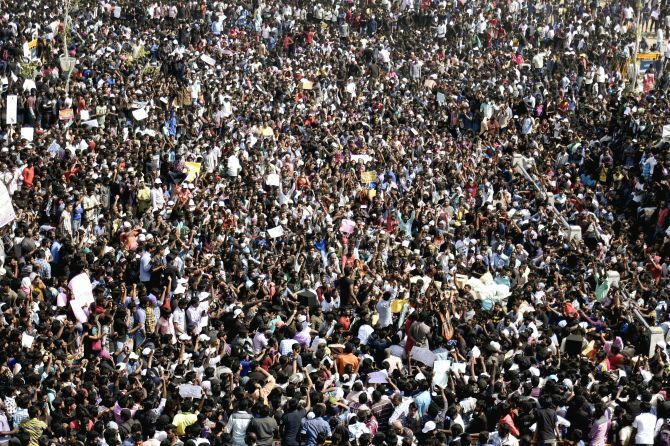 The biggest agitation in Tamil Nadu -- after the anti-Hindi agitation in 1965 -- were the Jallikattu protests. The anti-Hindi agitations had the backing of a political party, but this one did not. No famous actor was involved in it either. It was an incredible agitation. I was puzzled as to why a foreign NGO was determined to stop a sport that has been practiced for thousands of years in Tamil Nadu. How did you get funding for such a political film? A few friends helped me. How long did the film take from conception to execution? I did a lot of research. I came to know that 18 young people were involved in mobilising support for this agitation. First, I had to find them. After that, it was easy. It took me a year to finish the movie. Surely you anticipated Censor Board troubles, given the story? I am telling the truth, I have proof. Why would I expect censor trouble? Is the film a political statement? No, politics has nothing to do with this movie. What is your political alignment? I belong to what we call the food party. We work for our food. Were you ever involved in politics? Why is the censor board against your film? I don't know. What they have objected to was my taking names of a central minister, a famous actress and a sitting MP. Are you confident of a wide release? The movie is ready for release. I don't know how wide the release will be. It is not easy to get theatres to release such movies. So what remains between you and the release? In this day of mega budget films like 2.0, how much did your film cost? I have answered all your questions, please don't ask this question.